Gallons of fluorescent paint. 40,000 people. Every kind of music you could think of. Thousands of buckets. A midnight countdown. One beach. 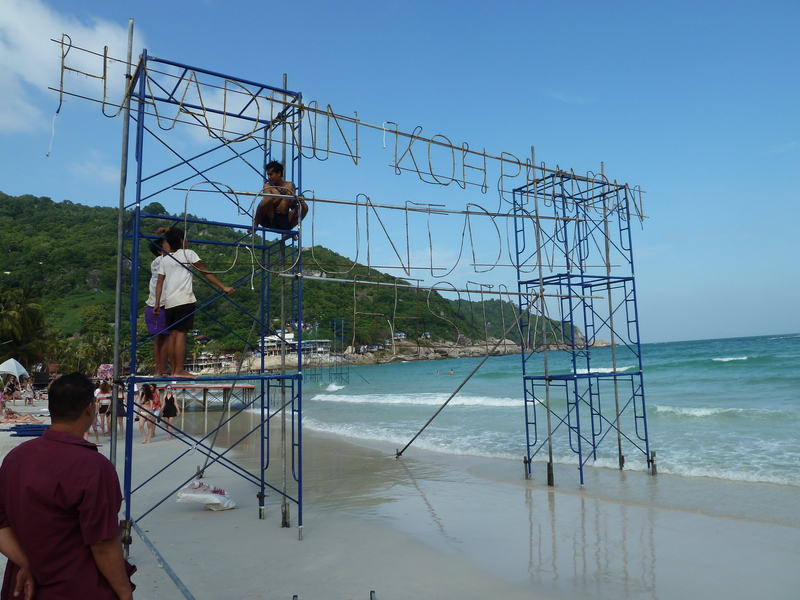 Welcome to Koh Phangan’s New Year Full Moon festival. Its regularly listed as one of the top 10 parties in the world. Imagine Cleethorpes beach covered end to end with dancing, illuminous t-shirt wearing, bucket holding partygoers, around a dozen huge sound systems, people from every corner of the globe… No actually, don’t. 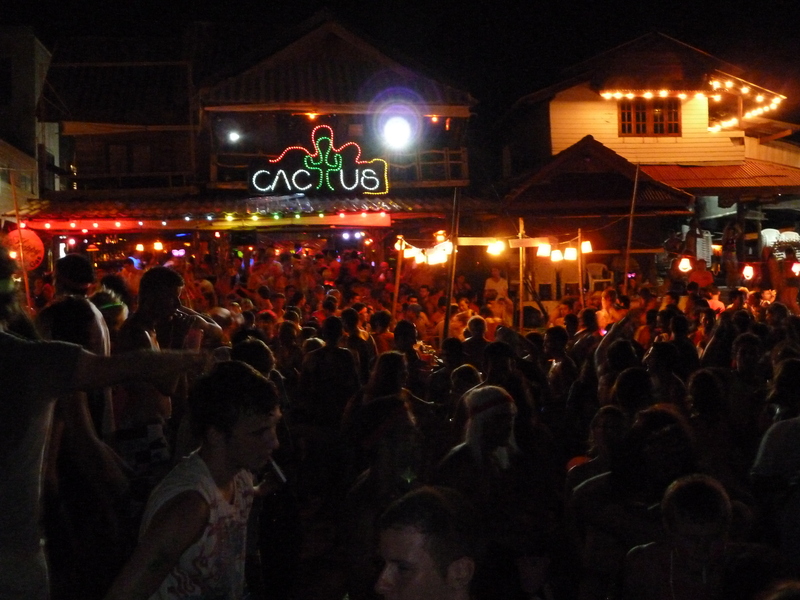 Unless you come to Koh Phangan and see a Full Moon party for yourself, there is no way you can get your head around the sheer scale of what happens every month on Haad Rin beach. 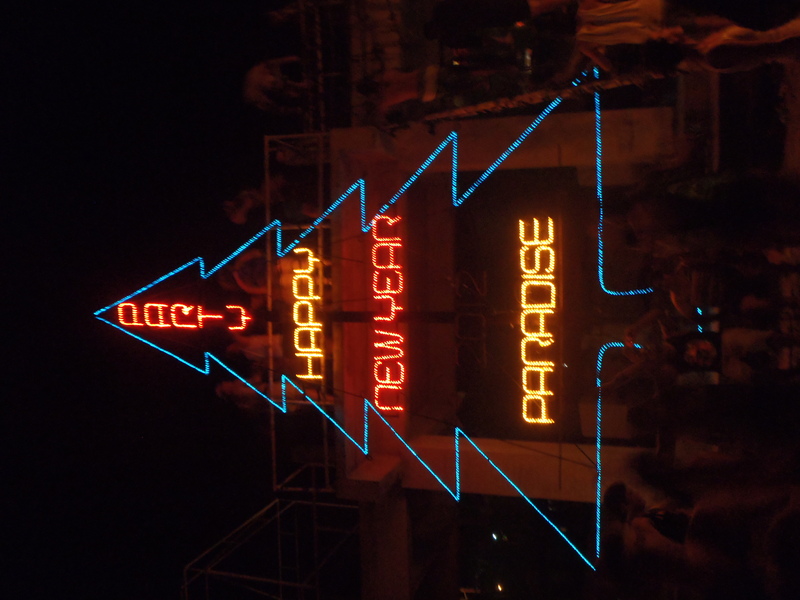 But then its cranked up even further for New Year – it gets even bigger. 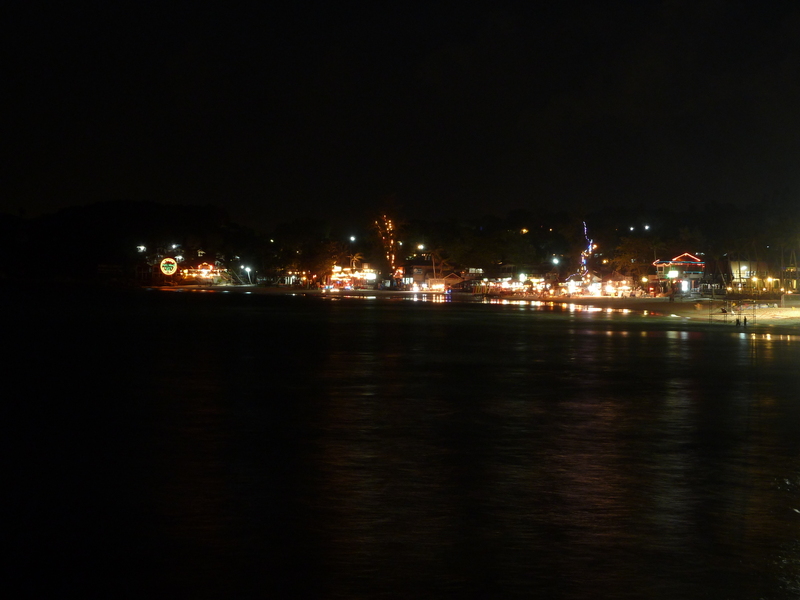 The smell of paraffin in the air from the dozens of fire shows and burning skipping ropes glowing along the shore. The sight of hundreds of people crammed high up on a temporary stage, dancing in unison to some of the biggest DJs around. The sound of the waves crashing ashore, lapping over the feet of some poor soul who passed out well before 2012 officially arrived. This is why I ditched my original plan to spend New Year in Sydney! On the beach, on the stroke of midnight, practically anyone travelling or backpacking in southeast Asia was there, looking up at the sky as half an hour of the most amazing fireworks filled every available space above the horizon. 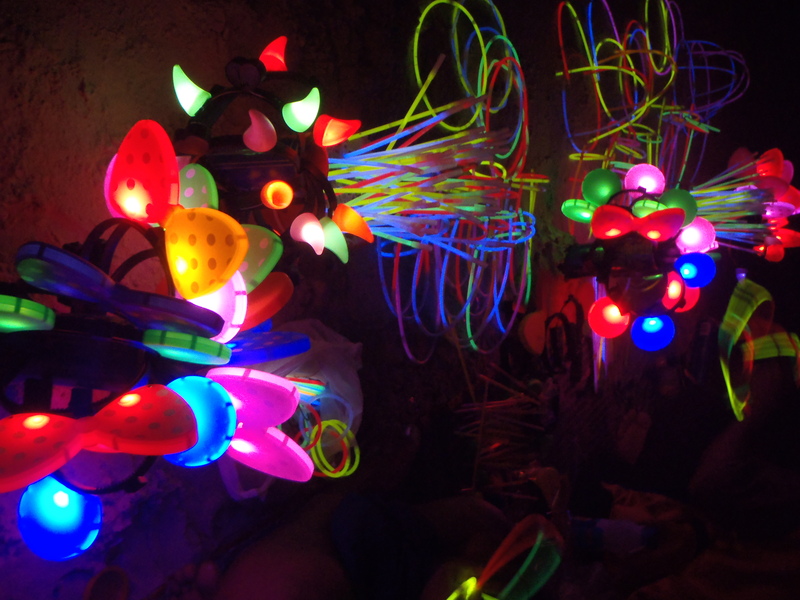 All around, everyone is covered in fluorescent paint, glowing under the ultraviolet lights dotted all over the sand. Be it stripes, dots, squiggles, my attempt at a Canadian maple leaf on my mate Bryce’s arm, or just random colouring in, it didn’t really matter – just as long as you had some on. Neon light sticks, glowsticks and glowing ears add to the effect as you look out across a sea of people towards the, well, sea. Fire breathers and fire jugglers add to the chaos. Throw in some tables to dance on, and well, you get the picture. As nights out go, the New Year bash here surely ranks as one of the best nights out you’ll have in your life. Things can get messy – so much so, I took no chances – camera, phone, watch, even my glasses were left behind in a locked safe. I went out blind…and after a bucket, it wouldn’t matter anyway! 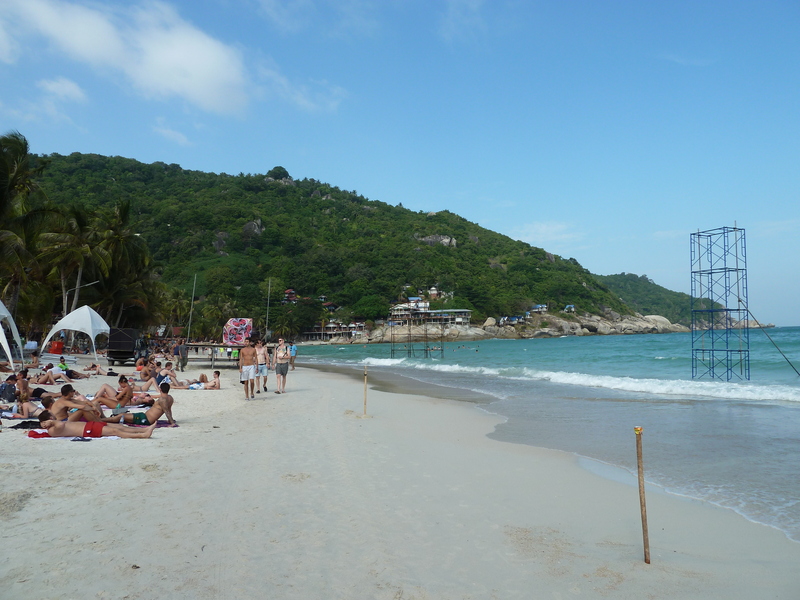 I arrived on the island of Koh Phangan absolutely shattered. Having stayed up all night to make sure I caught my 6am flight from Singapore, I’d only managed to grab an hours sleep on the plane. Infact, the only bits I remember of the flight are the safety announcements before take off, and a thud as we hit the tarmac in Krabi. I slept like a baby, but it was to be the only sleep I’d really get. 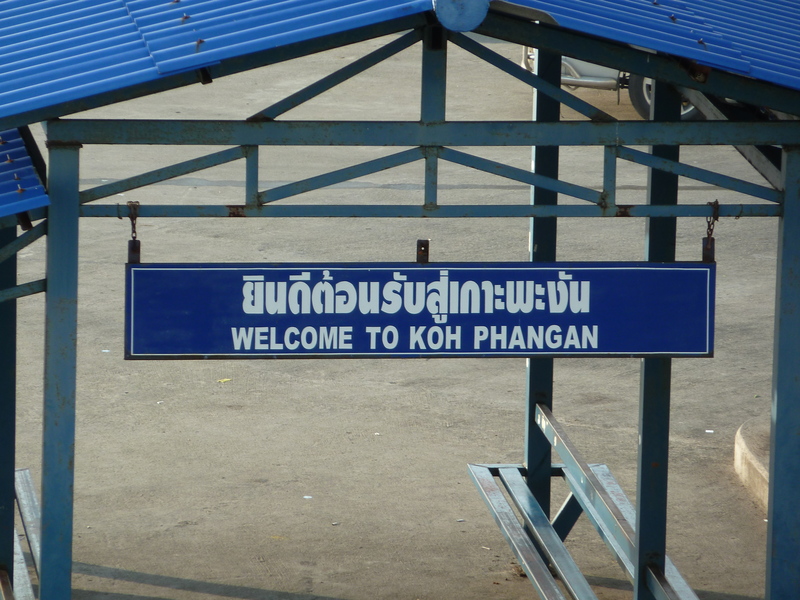 I was shepherded onto a crammed public bus at the airport, and then onto another even more crammed public bus at Krabi which then wound its way through every small village on its way to Surat Thani, on Thailands south east coast. 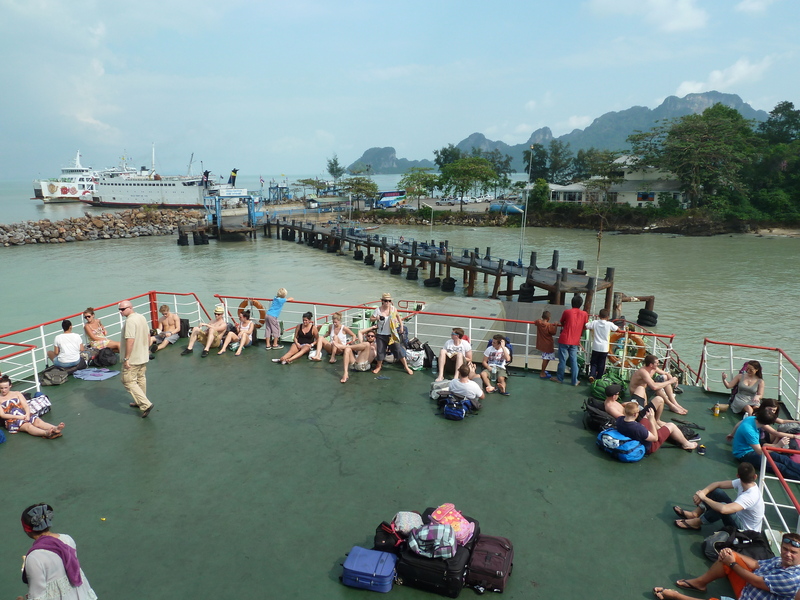 From there it was onto a large rusty ferry, absolutely full of backpackers heading to exactly the same party as me. It took three hours to sail to the island, where I was then bundled into a tuk tuk with a few others who were heading towards the main party town of Haad Rin. One girl suddenly jumped out after realising the place she was staying was only a short walk away. We wished her well! Bryce and Erin. And a bucket. 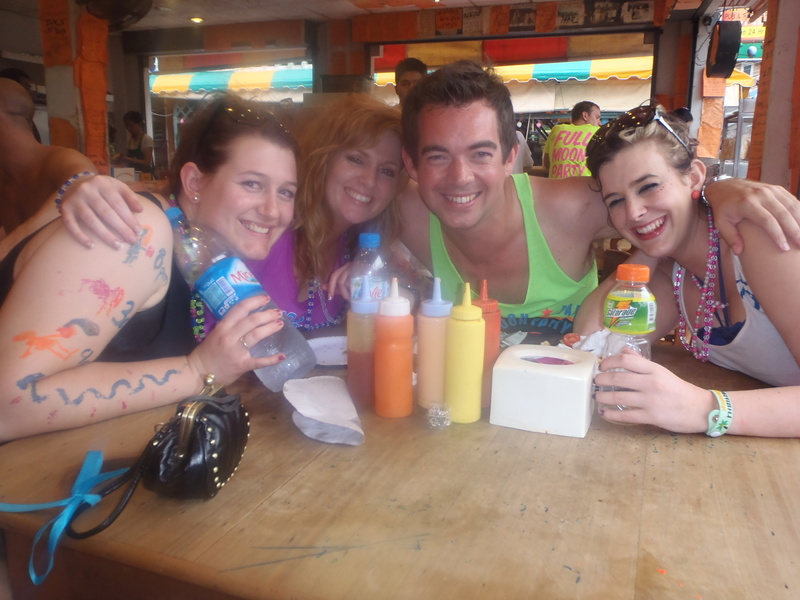 I was on my way to meet Bryce and Erin, the Canadian and American that I met at the Spicy Thai hostel in Chiang Mai. We’d had a brilliant time together, and got on so well, that we agreed to spend New Year together. 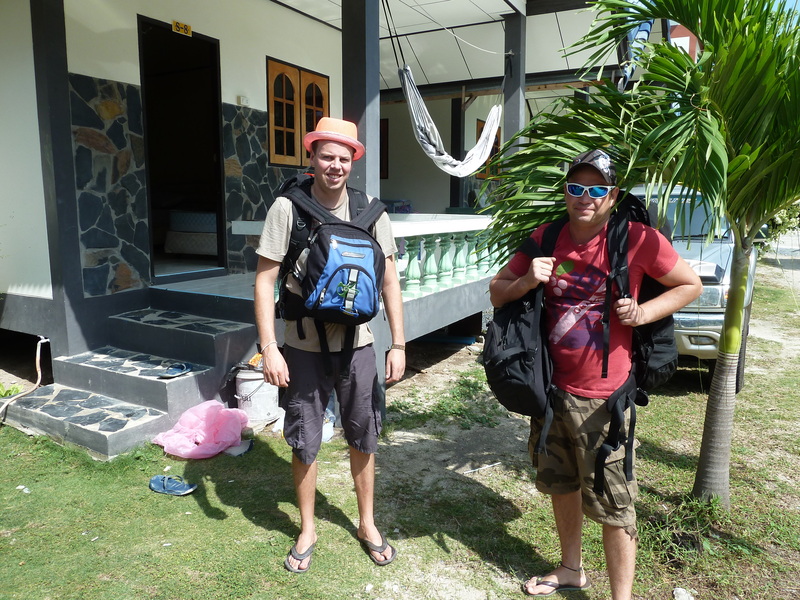 I was to share a bungalow with Bryce and his friend Wigley – real name Trevor – on the sunset side of the southern peninsula, helpfully just out of the way of the main chaotic area of Haad Rin. We enjoyed meeting up and had dinner together and discussed plans for New Years Eve the following day. 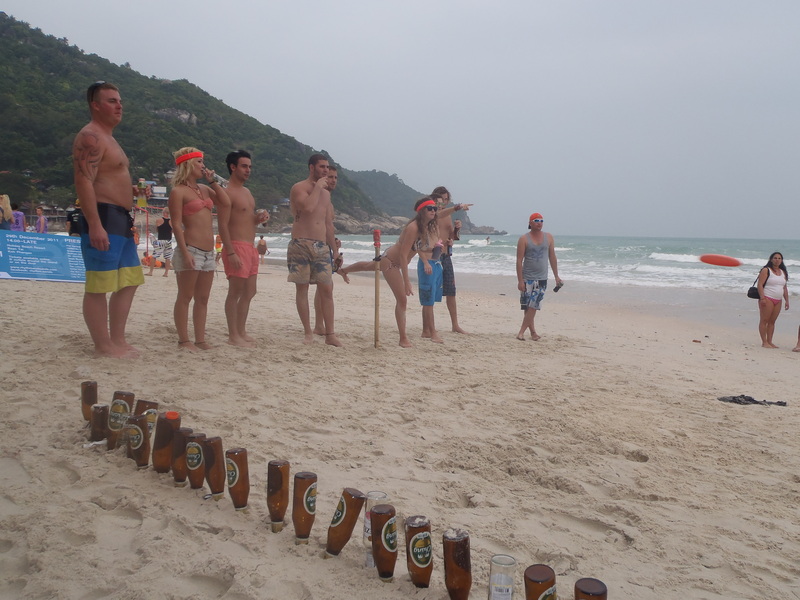 Beersbie was being touted as the main way of having fun on the beach and having a few drinks at the same time. Let me explain. In the back of a tuk tuk in Chiang Mai, Bryce handed me a business card that he’d had made up detailing the rules of a game involving a Frisbee and beer. Lots of beer. 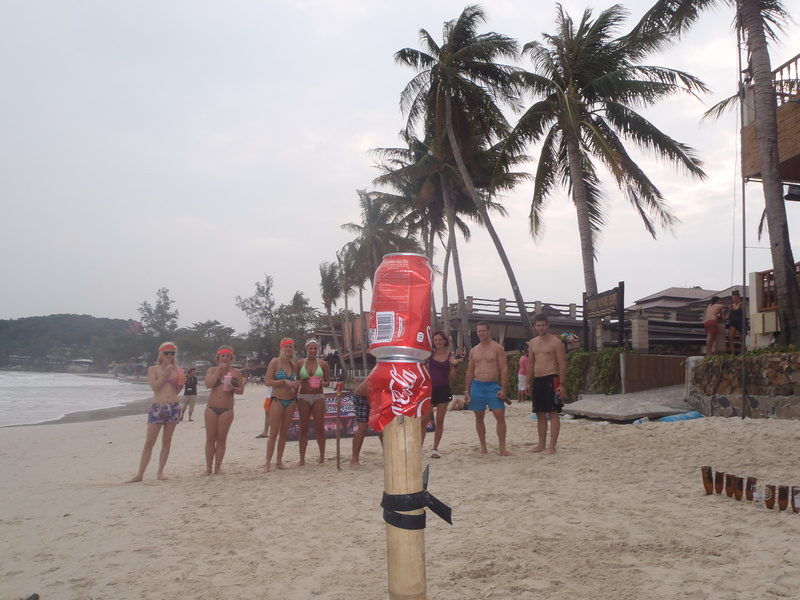 Its effectively an outdoor drinking game where you stand a can on a stick, split up into teams, and take it in turns to throw a Frisbee and try to knock the opposing teams can off their stick. Every time someone messes up, spills a drink, drops a catch, that kind of thing, the whole team has to have a drink. If the can is knocked off, the team has to try to catch it before it hits the ground! It soon became clear why I’d been advised to buy some ‘girly’ Bacardi Breezers – they are much easier to drink in rapid succession, as it’s a fairly fast-moving game! It was a perfect warm up for the evening – if you want to know more, visit http://www.beersbie.com. I might have to introduce it to Hull next summer. Oh, and I was on the winning team! 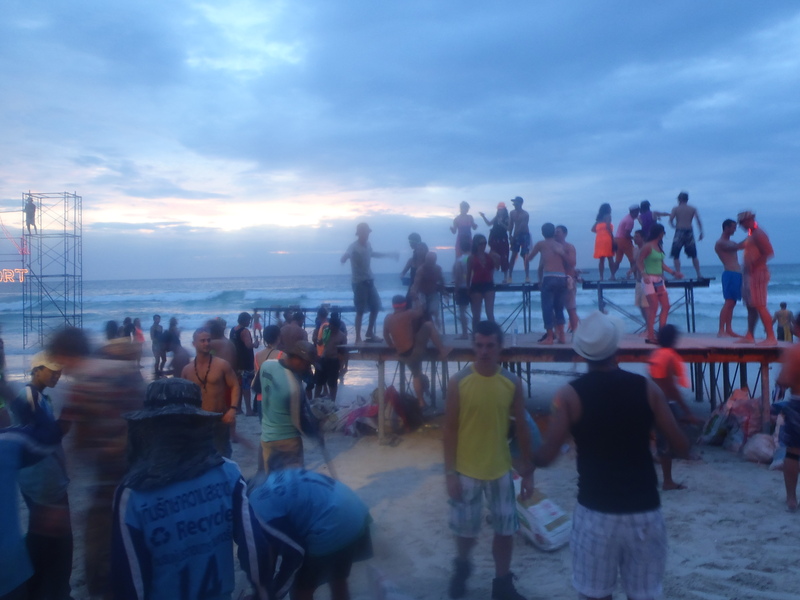 By the time we left the beach, preparations for the night were well underway, with countdown clocks, stages and lighting already being put in place. Its actually a really nice beach in addition to the party! With a New Year’s dinner of pie and mash to line the stomach, the festivities began with a trip to 7-Eleven. There’s something stupid like 300,000+ 7-Elevens in Thailand, pretty much everywhere you look. 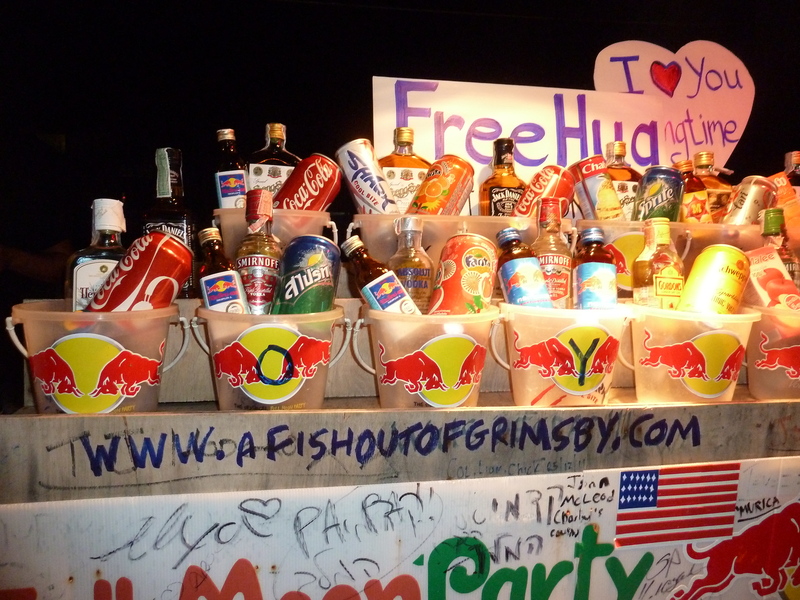 The best thing about them is the 7-Eleven bar. 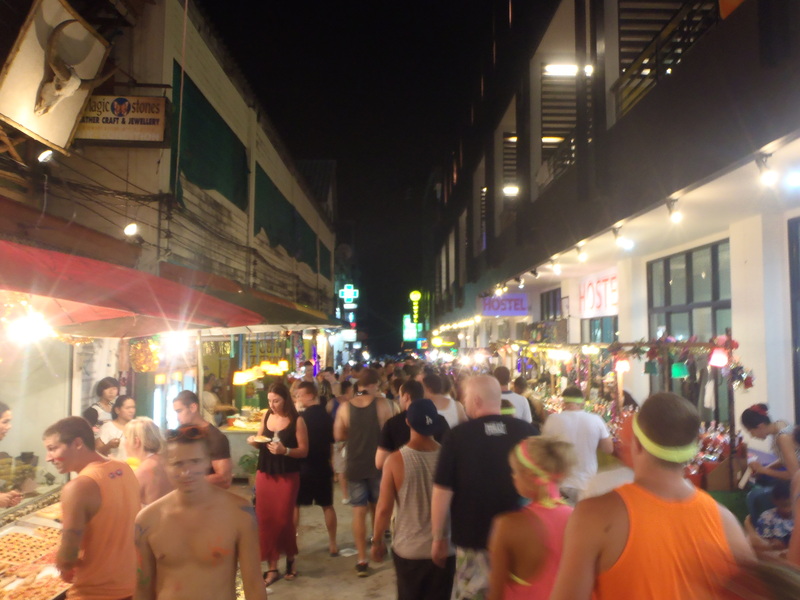 Of course, its not a bar, but a big chiller at the back of the shop, but the drinks in there are so cheap! Then it was down to the beach. Impressive, to say the least. I first came here in May last year, and somehow managed to pass out on the beach in the early hours. 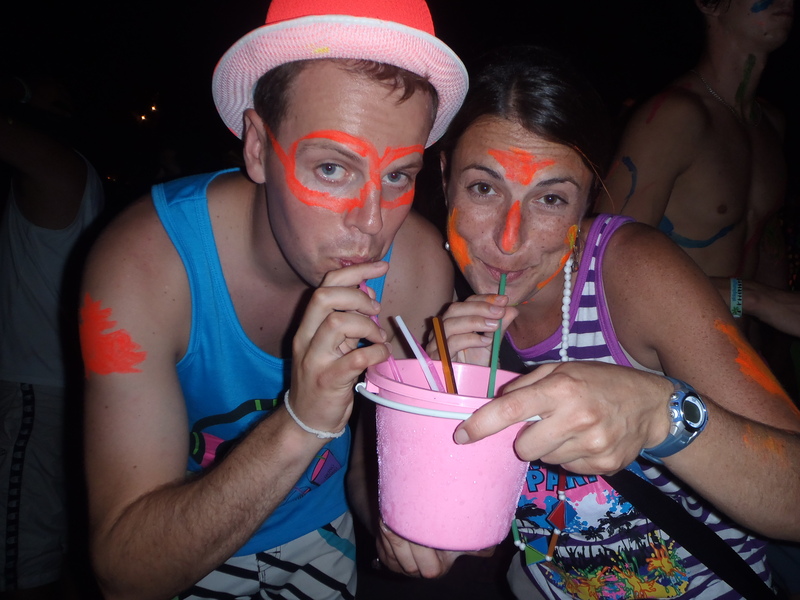 That’s because it was my first introduction to buckets – a bit of a Thai tradition, whereby you pick whatever poison is your favourite, to go with whatever soft drink you decide, and then mixed in with a bottle of Red Bull. They’re sold everywhere – by Mickey, by Jane, by John (they all have simple names to remember!) – each with their own little slogan. Some will ‘love you longtime’, some will ‘sell you their daughter too’, whereas my bucket dealer was Tony – he offers free hugs. With Tony Bucket, as Wigley demonstrates what his drinks can do to you! Tony is a great guy. I was introduced to him by Bryce and Erin and we would go on to know each other well over the next few weeks. He’s typically Thai – kind, funny, welcoming and with a smile that you just can’t seem to find anywhere else in the world. 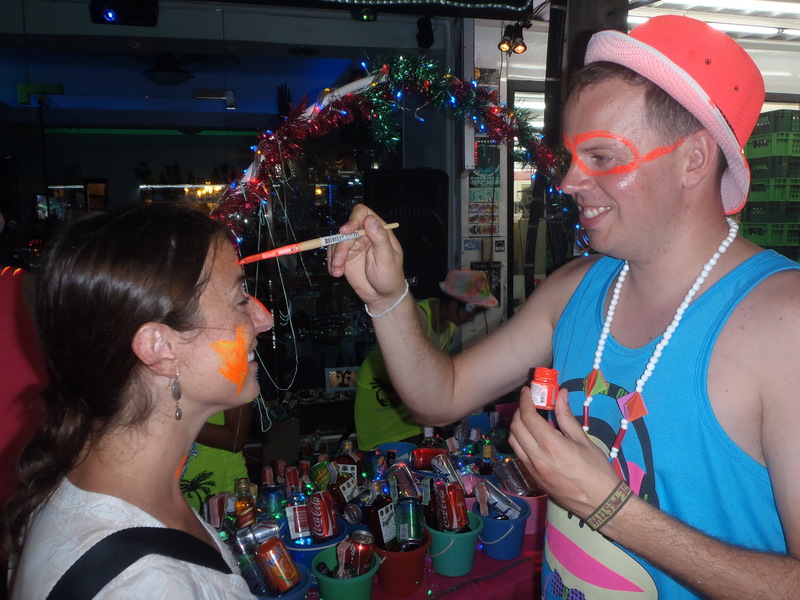 He has ‘Hi 5’ written on his hand in permanent marker every night, and has an amazing knack of remembering names of everyone who buys drinks from him. He also let me write my blog address on his stand after hearing about what I was writing! A bit of free marketing! I opted for a Sang Som bucket, mainly because its cheap, but also because although its called Thai Whisky, its actually rum. And I’m quite partial to a bit of rum! In it went, into my bucket, along with some Coke and a bottle of Red Bull. At this point, I need to do more explaining. This is not the Red Bull you can get at home. Well, it is, in that it’s the same company – except this stuff surely has something in it that jumps through legal substance loopholes more often than that legal bod gets celebrities off parking fines. It tastes like fizzy Red Bull at home, but there’s no fizz. There’s not as much of it either – its been condensed down into a little glass bottle. And it can keep you awake until the next Millennium if you drink too much of it. All in all, it’s the stuff that keeps everyone going until sunrise, and after a couple of Tony’s buckets, its easy to see how I managed to pass out last time I was here, much to my friend Cat’s amusement. Determined not to do something similar, I eased off a little, but then I had a bigger problem. Following the orange shirt of one of Bryce’s friends towards the countdown clock, there were just minutes left before the New Year started. And then he turned around. It wasn’t him. I looked back behind me. Bryce was no longer there either. Somehow I’d lost everyone. With three minutes left on the countdown, and it being nigh on impossible to find anyone quickly on the beach, my heart sank. I was on my own. At around the time I should have been linking my arms with Bryce, Erin and the gang and singing that Auld Lang Syne song for the year, I was actually smiling at everyone celebrating around me and watched the fireworks launch from the stand in front of me. After a pretty rubbish New Year last year thanks to ex girlfriend situations, I made a vow while I was with my mate Rich in Pozition nightclub as the clock struck midnight (yes, Pozition…it really was that bad a New Year!) that in a year’s time, I would be somewhere far away and having an amazing time, that I’d get hold of my life and have something fun to celebrate within the next 12 months. I might have been stood on my own, but I was watching some incredible fireworks alongside tens of thousands of other people who were all in the same boat as me. On a beach, in the warmth, thousands of miles from home and in the middle of epic journeys, meeting new friends and making memories to last a lifetime. If someone would have grabbed hold of me at the bar in Pozition that night and told me exactly what I would be doing on that night in 12 months time, I would never have believed them! I made my way back towards Tony’s bucket stand, an agreed meeting point, and met up with Wigley and a few of the other guys from Canada. We headed off, got on some tables, and danced. 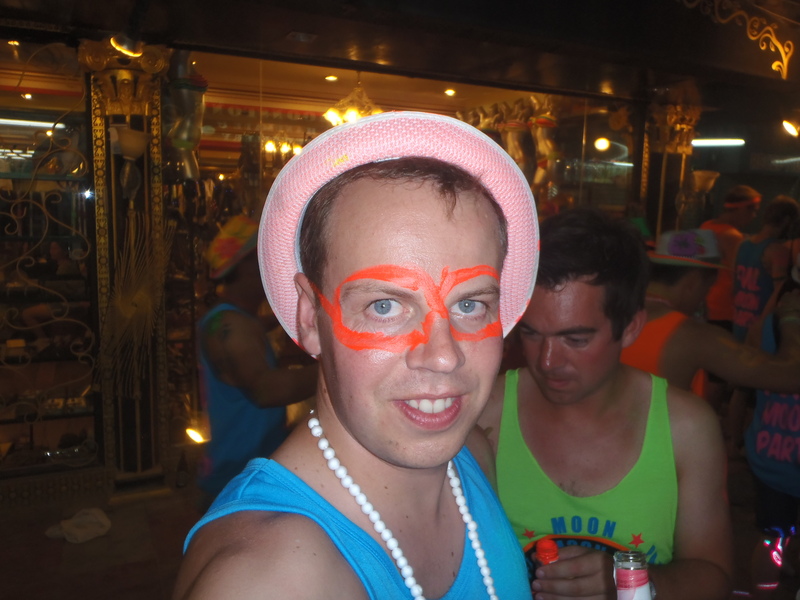 I ended up talking to some Australian guys, who loved the fact I apparently sound like one of the Inbetweeners. 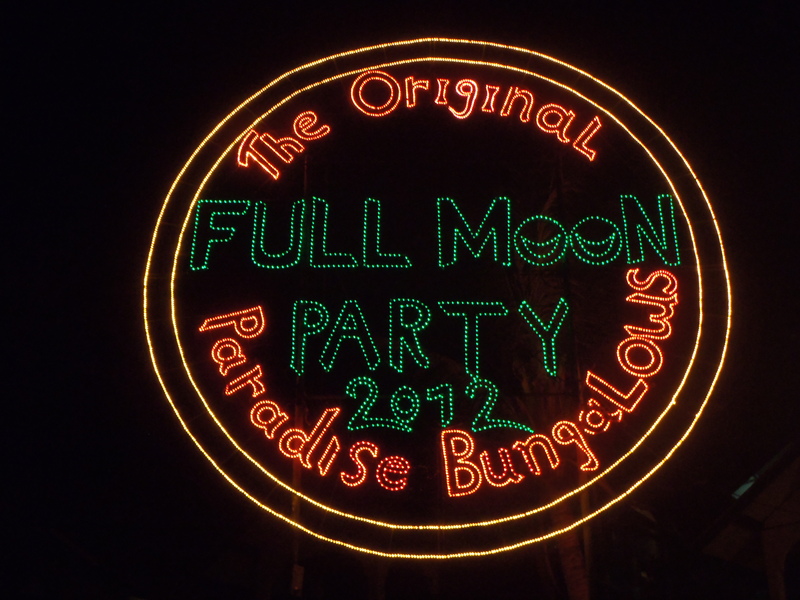 In the end, I spent most of the night with them, laughing, dancing on tables, falling over in the sea, buying new, and dry, Full Moon t-shirts and generally having a fantastic time. It was one of those nights where time just flies by, when you’re having so much fun meeting people and dancing, that suddenly it’s the early hours. 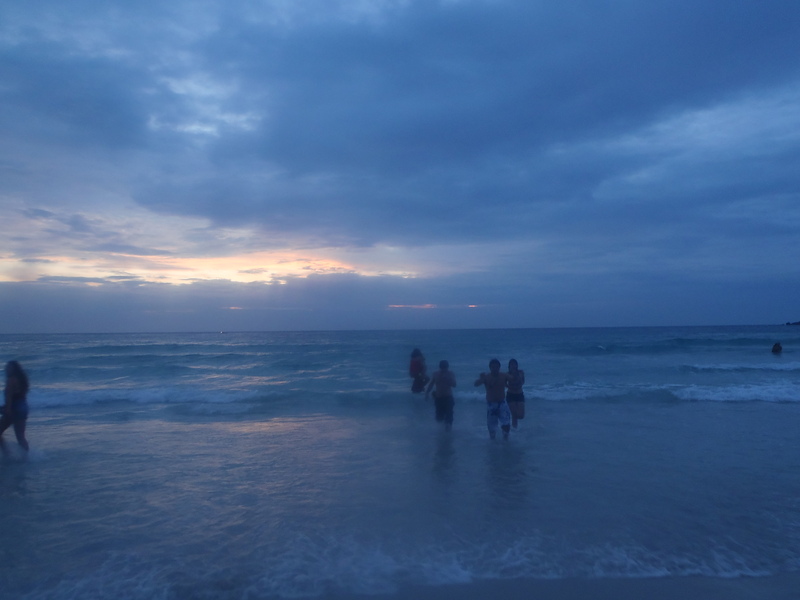 A group of us sat down on the sand, and before we knew it, the sky started to brighten. We sat and watched as the sun rose on the horizon ahead of us. 2012 had dawned. Somehow Bryce found me as I was laying on the sand with my new Australian friends, and we all sat together for a few hours before heading to Chicken Corner, one of the most famous food places on the island, for a chicken sandwich. Clearly far too excited about a chicken sarnie breakfast. It was good though! 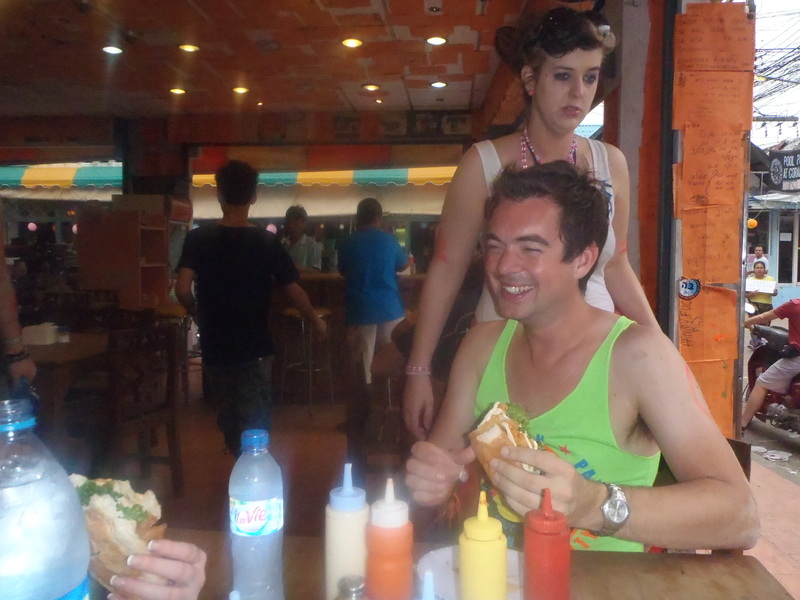 We all had loads of banter over the chicken sandwich, and for some reason none of us felt that tired. There were so many people milling around, yet everything I saw was so good natured. The travelling community here, while there may be the odd mishap or fight here and there (not that I actually saw any, but then there are enough people to fill Blundell Park almost five times over) is such a friendly bunch. It might have been a slug impression?! I walked the group of Australian girls we’d met back to their morning ferry for their rough-looking crossing back to Koh Samui, where they were staying, and headed back to the bungalow. In the words of the Inbetweeners...'ahh, Friends...New Year Australian Friends'! It was 9.30am. Somehow, the whole night had passed. Back home at that time I’d already be 15 minutes into the Look North morning meeting. But here I was, stumbling into bed, having had one of the most amazing nights of my life. 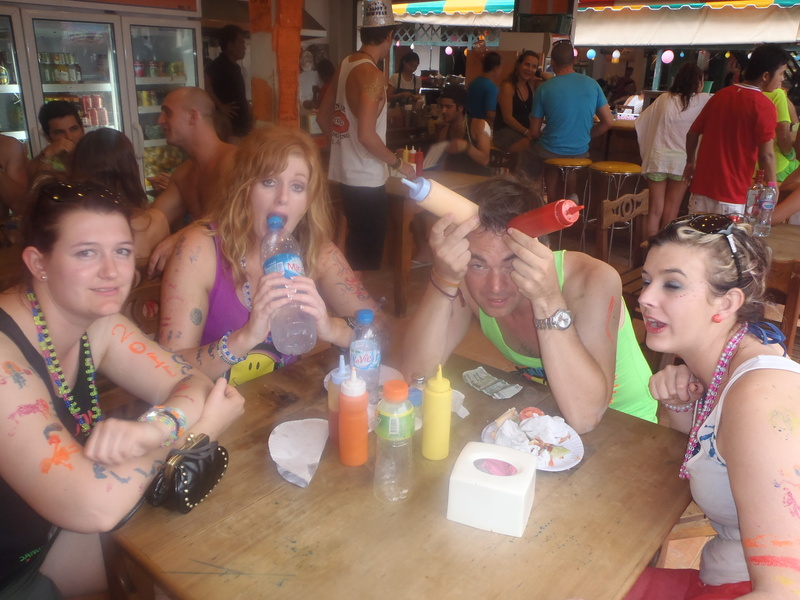 Thankfully, the hangover – or Changover in these parts thanks to the beer – wasn’t too bad. The weather, however, was. From nowhere, an almighty storm had descended on the island. 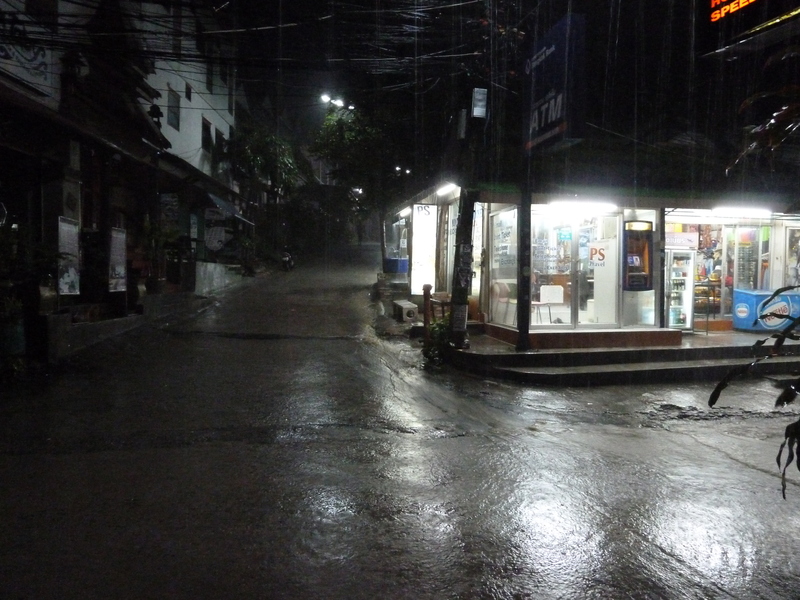 It was so bad, the boats to and from Koh Phangan had been cancelled. Those who had planned to leave during the day after New Year were stranded. There was nothing they could do but sit it out. As did we all. There was almost one casualty of my post-Full Moon New Year state – my netbook. Sitting on the porch, recounting stories from the night before, my netbook was on my lap in a desperate search for some wifi. Suddenly a gust of wind caught the screen, which acted like a sail and pulled it off my knee. Somehow I managed to catch it – with my hand that was holding a Shrimp Tom Yum pot noodle. I’d saved it from certain oblivion on a tiled floor, but I’d poured all manner of herbs, spices and liquid all over it in the process. Annoyingly, ‘p’ and ‘0’ were the only keys that wouldn’t work. Some said it could have been worse. Not when you’ve got the name Phillip, it couldn’t. After having it in bits, including taking the keyboard completely out to dry it, it was still having none of it. The blog would be incredibly hard to keep up from now on. And on all my forms I’d be known as Hilli. Not the best. 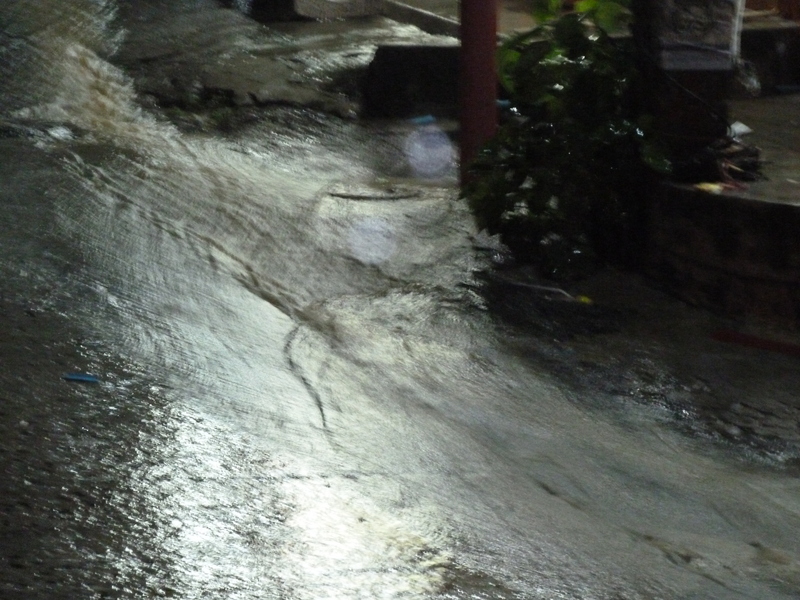 The storms continued for two days, resulting in numerous power cuts and travel dilemmas for people on the island. We sat it out by playing cards and drinking Chang. 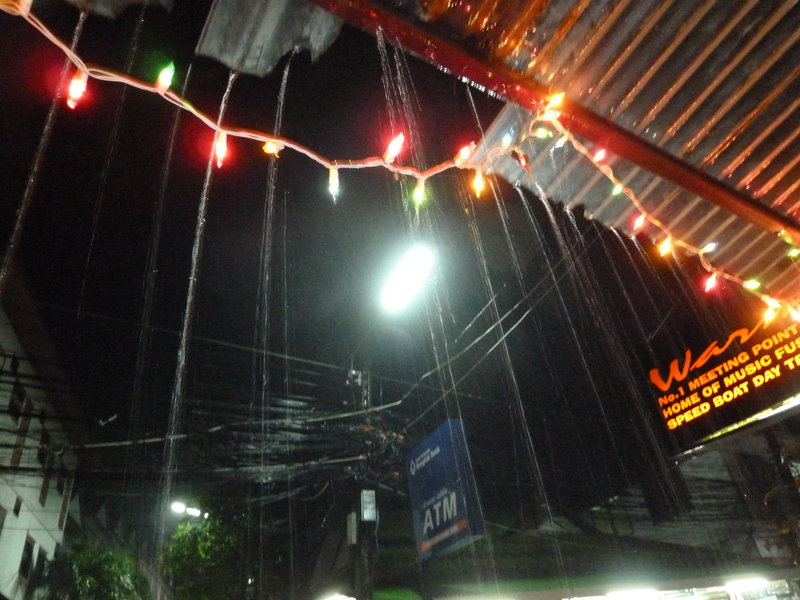 Oh, and by drying my netbook – by the time the storms passed, it was fully working again.